This sunstone has a pleasing pattern of streaks of copper schiller, but not so many as to make the stone look overly cloudy like most schiller sunstones. It was cut with a brilliant pavilion and cabochon style crown to emphasize the streaks of schiller. 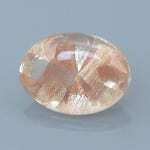 Comments: This sunstone has a pleasing pattern of streaks of copper schiller, but not so many as to make the stone look overly cloudy like most schiller sunstones. 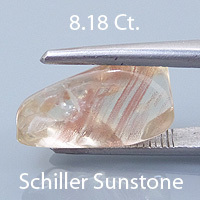 It was cut with a brilliant pavilion and cabochon style crown to emphasize the streaks of schiller.